Posted October 5th, 2017 & filed under Supply Chain Management. 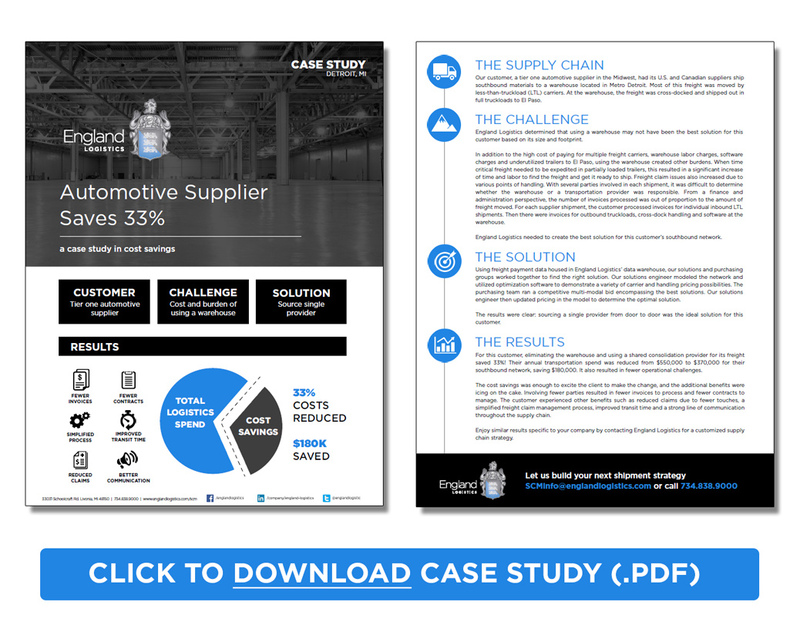 Maintaining a solid cost strategy in a supply chain can seem out of reach. Fortunately, England Logistics has many remedies to save you time and money. 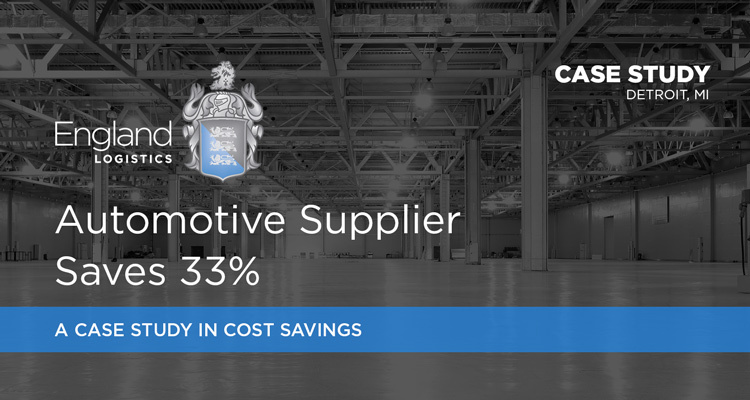 Our customer, a tier one automotive supplier in the Midwest, had its U.S. and Canadian suppliers ship southbound materials to a warehouse located in Metro Detroit. Most of this freight was moved by less-than-truckload (LTL) carriers. At the warehouse, the freight was cross-docked and shipped out in full truckloads to El Paso. England Logistics determined that using a warehouse may not have been the best solution for this customer based on its size and footprint. In addition to the high cost of paying for multiple freight carriers, warehouse labor charges, software charges and underutilized trailers to El Paso, using the warehouse created other burdens. When time critical freight needed to be expedited in partially loaded trailers, this resulted in a significant increase of time and labor to find the freight and get it ready to ship. Freight claim issues also increased due to various points of handling. With several parties involved in each shipment, it was difficult to determine whether the warehouse or a transportation provider was responsible. From a finance and administration perspective, the number of invoices processed was out of proportion to the amount of freight moved. For each supplier shipment, the customer processed invoices for individual inbound LTL shipments. Then there were invoices for outbound truckloads, cross-dock handling and software at the warehouse. England Logistics needed to create the best solution for this customer’s southbound network. Using freight payment data housed in England Logistics’ data warehouse, our solutions and purchasing groups worked together to find the right solution. Our solutions engineer modeled the network and utilized optimization software to demonstrate a variety of carrier and handling pricing possibilities. The purchasing team ran a competitive multi-modal bid encompassing the best solutions. Our solutions engineer then updated pricing in the model to determine the optimal solution. The results were clear: sourcing a single provider from door to door was the ideal solution for this customer. For this customer, eliminating the warehouse and using a shared consolidation provider for its freight saved 33%! Their annual transportation spend was reduced from $550,000 to $370,000 for their southbound network, saving $180,000. It also resulted in fewer operational challenges. The cost savings was enough to excite the client to make the change, and the additional benefits were icing on the cake. Involving fewer parties resulted in fewer invoices to process and fewer contracts to manage. 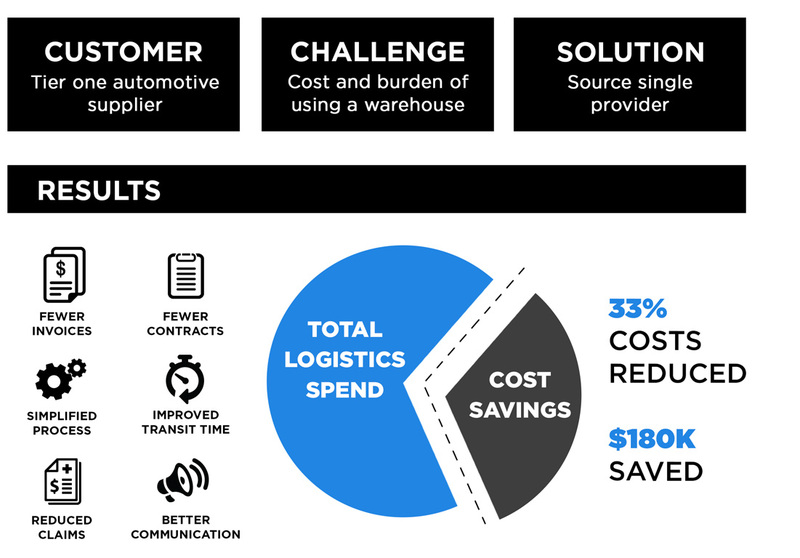 The customer experienced other benefits such as reduced claims due to fewer touches, a simplified freight claim management process, improved transit time and a strong line of communication throughout the supply chain. Let us build your next shipment strategy! Call 734-838-9000 or visit our Supply Chain Management page to request a free quote.